Granites: Patterns, Puzzles and Possible Projects. 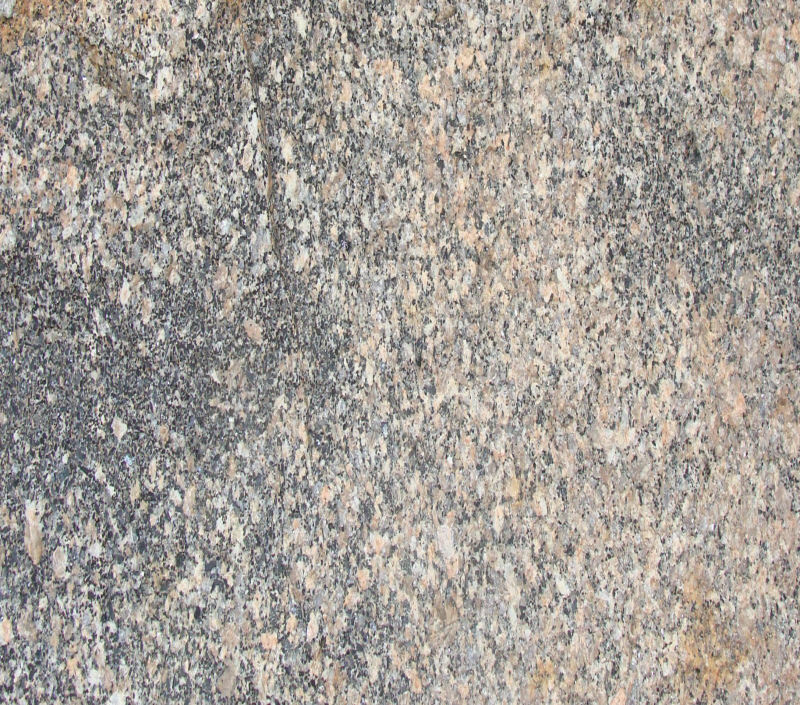 There are three granite masses in Jersey only about 5 km (c.3 miles) apart and each consists of several different granites which have been described and dated. Following detailed chemical analysis, an intrusion model has been proposed involving mantle derived magma, crustal assimilation and a final closed system of fractional crystallisation (Brown et al, 1990, p.197). However, the outcrop patterns of each and their ages seem to present puzzles regarding their geometric shapes, the sequence (from dating) and the mechanism of their intrusion. The comprehensive field work and mapping of Bishop & Bisson (1978, 1989) and the detailed analyses and interpretations of Brown, Power, Topley & D'Lemos (1990) are fully acknowledged below and I could not have followed this 'trail' without their stimulating contributions to unravelling Jersey's geological history. Jersey granite outcrops from the detailed work of Brown, Power, Topley & D'Lemos (1990. p. 195) alongside the sea floor geology map ( IGS Guernsey Sheet 49N 04W Solid Edition, 1976, the work of British & French geologists. The granite boundaries have been transferred from the first to the second and inferred 'bay' boundaries added, plus possible boundaries in the SE granites from age data. The masses are described briefly as the SW, NW and SE granites. The patterns and puzzles fall into two categories; the first concerns their outcrop patterns, shape with depth and hence their mode of formation, and the second concerns their textures and mineral assemblages. The patterns in question are the arcuate to oval outcrops of the several different granites in these masses, striking E-W and opening respectively to the south and north (due to coastal erosion) but apparently closing seawards. 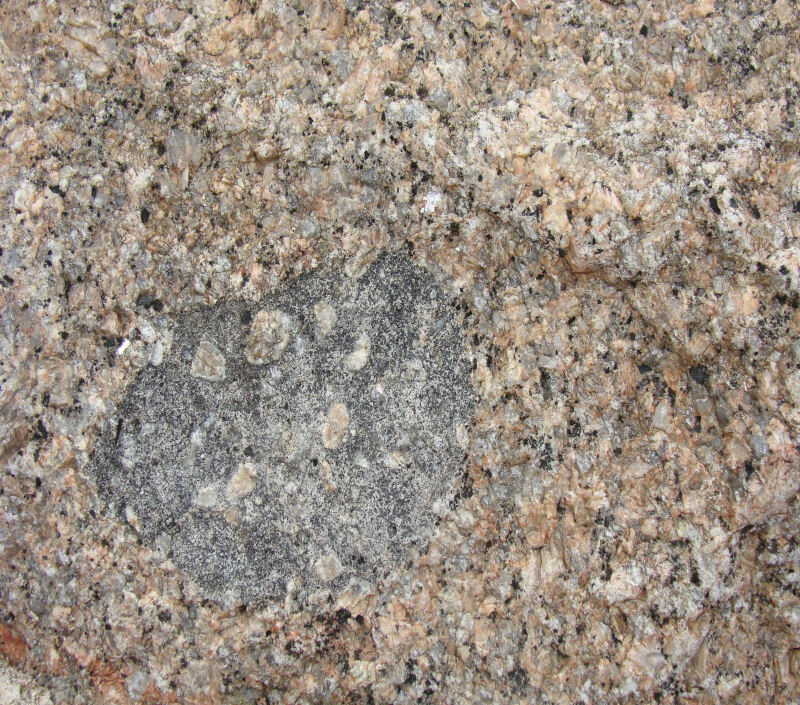 The SE granite also seems semi-arcuate but strikes NE-SW around a core of gabbro-diorites. The individual granites within each mass are of different ages, formed or intruded at different times. 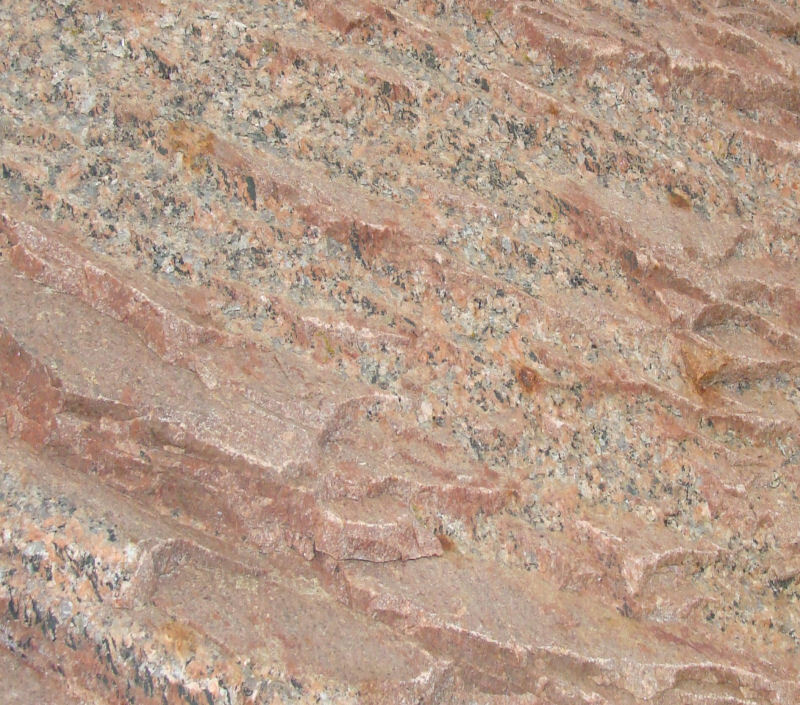 The contacts of the NW and SE granites with parts of the country rock are steep while the inner boundaries between the different granites are described as gradational; the SW granite-country rock contacts are not seen. 2. Shape with depth patterns. Continuity of outcrop is shown on the IGS map (see below) and by geophysics. The NW granite continues northwards offshore until overlapped by Tertiary limestones and geophysical evidence (Briden et al. 1982) shows it to be continuous with the SW granite 1800-600m (W to E) below a 'raft' of the Jersey Shale Formation (Helm, 1984. p. 11-12; Bishop & Bisson, 1989. pp. 98-101). The SW granite is also shown to be continuous with the SE granite across the southern part of St. Aubin's Bay and continues southwards until it is cut off to the south by an E-W fault; each of the outcropping parts is only 4km (2.5 miles) from the next. This follows the geophysical work of Briden et al. 1982, pp.35-48, also mentioned by Helm, 1984, p. 11 and amplified by Bishop & Bisson, 1989, pp. 95-103. None shows the disposition of the individual granites nor their differences in age. 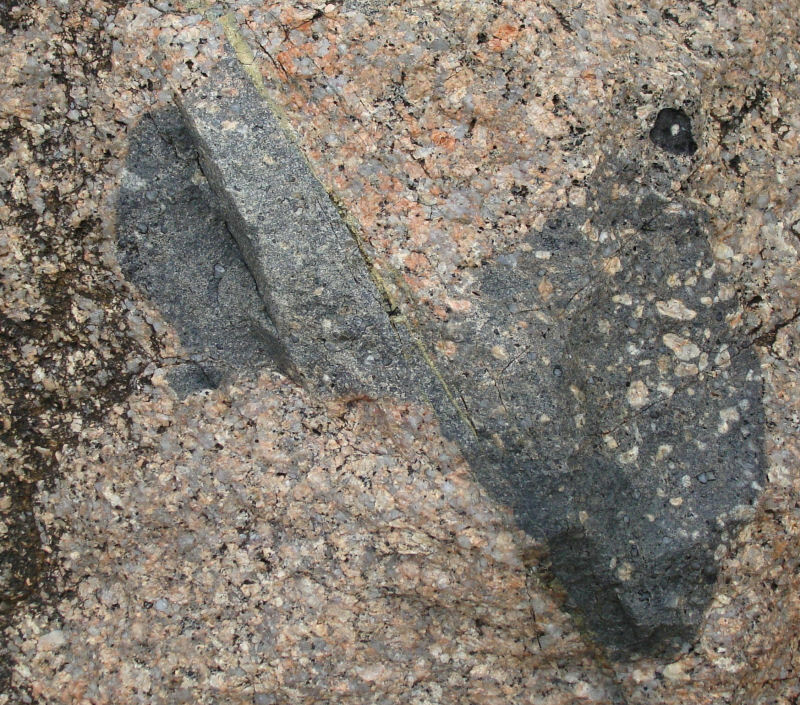 In the SE granite mass, the Dicq-Longueville Porphyritc granite (570 Ma) formed around the older diorite-gabbro core (580 Ma). This was followed 61 Ma later by the variable outer ring of the western margin Eliz. Castle-Ft. Regent granophyre and the eastern margin coarse granites of Le Hocq-La Roque-Gorey (509 Ma). These types differ from each other in their crystal size and amount of quartz, and records of boundaries or zones. In the SW granite mass, the middle ring La Moye Porphyritic granite (at 550 Ma) was followed 23 Ma later by the central Beauport Aplite granite (527 Ma). This was followed 44 Ma later by the Corbière Coarse granite (483 Ma) of the outer ring. In the NW granite mass, the middle ring Porphyritic granite (465 Ma) intruded older diorite-gabbros and formed around a central undated Biotite microgranite. The Porphyritic granite was followed 27 Ma later by the outer Coarse granite (438Ma) and this was followed 12 Ma later by the eastern marginal Red microgranite (426Ma). The table below summarises this information. 4. Intrusive location and sequence patterns. SW granite chemical analyses with respect to Rb versus (Y+Nb), show enhanced Rb and High Field Strength (HFS) element contents which results in many of them plotting in the field of Within Plate Granites (WPG) (Brown et al. 1990. p. 197-98 quoting the work of several previous authors, Pearce et al. 1984; Wood, 1979; Bland, 1985 and Brown et al. 1984). In addition, the patterns in a 'primordial mantle-normalised element variation diagram' for the average composition of each of the SW granites show the central Microgranite (derived by fractional crystallisation from the adjacent Porphyritic granite) to be similar to normal - mature continental arc patterns, while the patterns of the younger, outer Coarse granite show similarity to those of mature continental arcs. 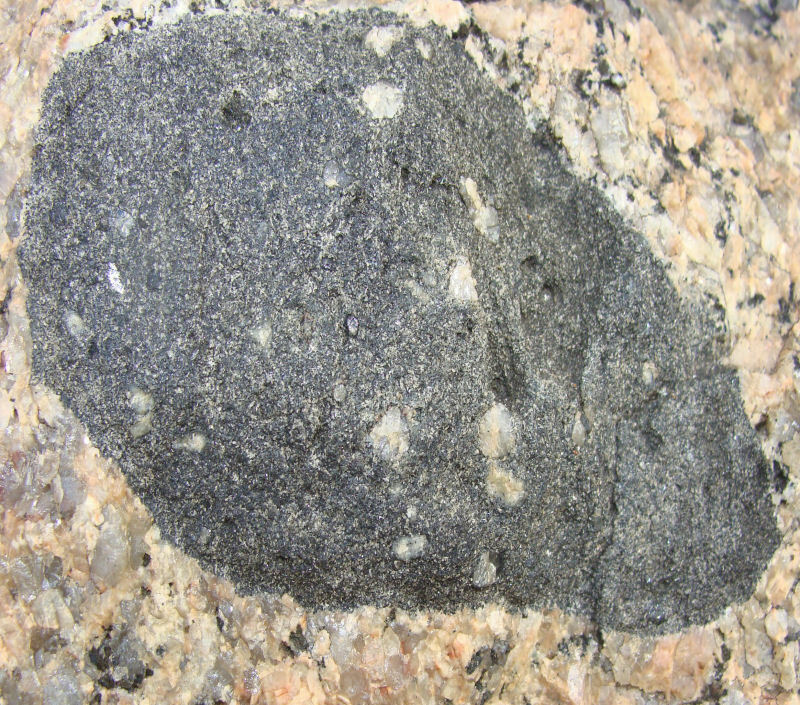 In contrast, most of the granites in the NW granite mass are considered to represent Volcanic Arc Granites (VAG). The SE granites' sequence seems to alternate with that of the SW granites, although there are 'no reliable isotopic age determinations' for the SE granites (Brown et al. 1990, p.196). However, if one assumes the problematic dates of the SE granites to be those given by Bishop & Bisson (1989, p. 59), then the following seems to be the case. The oldest is followed by two of the SW granites, while the later SE granites are described as younger than the SW granites (on a relative basis) because they are thought to be coeval with the Dyke Swarm event, the dykes of which cut the SW granites (Brown et al. 1990, p. 196). The NW granites (along with the SE Granite Complex and the Jersey Main Dyke Swarm) although including older diorite-gabbro components similar to those of the SE granites, are dated as the youngest and all are thought to represent the last magmatic activity of an already decayed subduction zone system of a Cadomian arc system during the last stages of the Cadomian Orogeny (Brown et al. op. cit. p. 198). The following table is a summary. Puzzling questions, about which there seems to be limited conjecture, are about the geometry and the mode of intrusion over the time spans, but additional questions concern the relationships of the different granites/granophyres (Le Hocq-La Rocque-Gorey- Ft. Regent-Elizabeth Castle) all of the same age in the outer ring of the SE granite... do they grade into one another and truncate the older Dicq-Longville granite at its northern end? 1. What are the shapes of each mass, and of their individual granites, with depth? Le Pignonet (W nr. 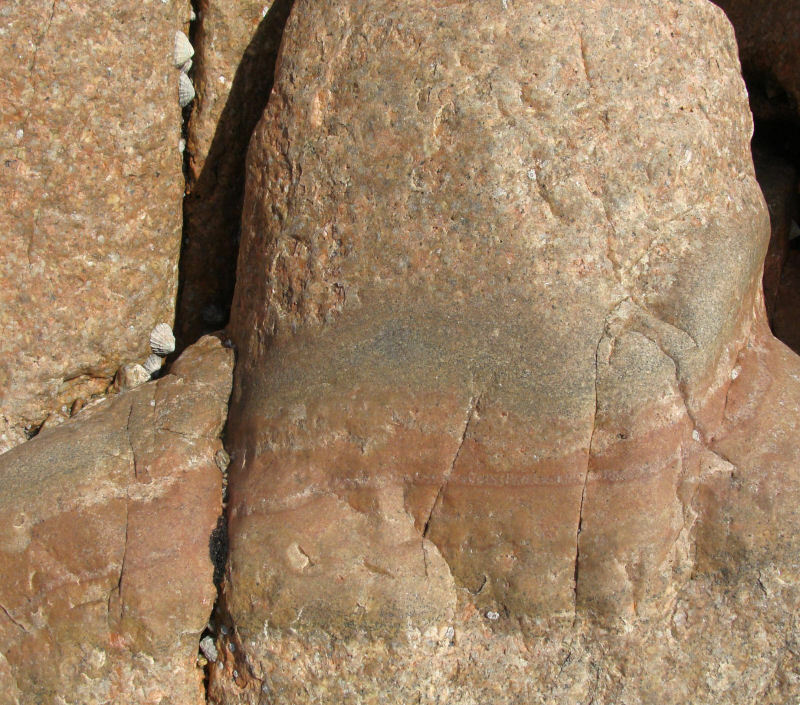 Noirmont), red aplite granite; Les Grunes du Port & Les Sillettes (W & S of bay), coarse granite; Ruaudière (mid-bay), Les Grunes aux Dardes (S) and Hinguette (SE), gabbro; Oyster Rock (nr. Eliz. Castle), mixture of plutonic rocks, mainly basic. 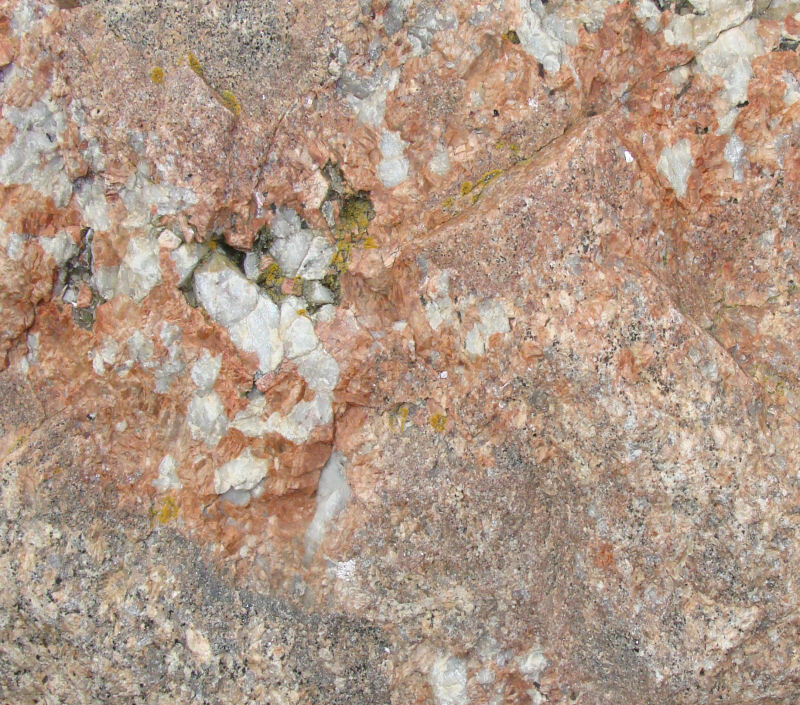 The first outcrops resemble the SW granites (described below), the latter resemble those of the SE granites/diorites (Robinson, A. J. 1932. p.7). The concluding statement that 'the granite of Corbière is continuous with that of La Rocque' doesn't seem to question the possibility of a boundary between two different granitic suites or provinces. ... and between the SW outer coarse Corbière granite (483 Ma) and the outer NW coarse granite (438 Ma) below the Jersey Shale across St. Ouën's Bay. In each case, there are only 4km (2.5 miles) between them but respectively in time, 26 Ma (SE-SW) and 45 Ma year (SW-NW) gaps between them. 3. Do the masses represent zones, pulse - diapiric intrusions... or individual 'gash' intrusions (Hecht & Vigneresse, 1999, p. 99) along the E-W fold axes (D2, Helm, 1984, p.11) in the Jersey Shale country rock, or along the WNW-ESE wrench faults (Bishop & Bisson, 1989. p. 76, who refer to Squire's work, 1974), with repeated 'batches' of magma producing their internal granites? 4. Given gradational contacts, do all the individual granites result from fractional crystallisation? 5. Are the time intervals acceptable for each possible process? 6. What processes, in 3D, led to the formation of the gabbro-diorite masses and the intrusion of the granites from below, given the detailed conclusions of mantle derived magma, crustal assimilation and final fractional crystallisation processes (Brown et al. 1990. p. 197). Although the intrusion dates of our individual granites show a different sequence (ie. youngest in the outer ring) from that of the Cabeza de Araya (Hecht & Vigneresse, 1999, p. 96), more detailed geophysical projects may resolve some of the above questions, eg. 3D gravity inverse modelling (see Vigneresse, 1990; Améglio et al. 1997, in Hecht & Vigneresse, 1999). In each of the granites masses, the crystals of quartz, orthoclase feldspar and biotite show a variety of form and mineral content within themselves and in association with adjacent crystals. However, they seem more variable in the SW granites (no statistical studies have been done), especially in the older, middle Porphyritic ring and the younger, outer Coarse ring. 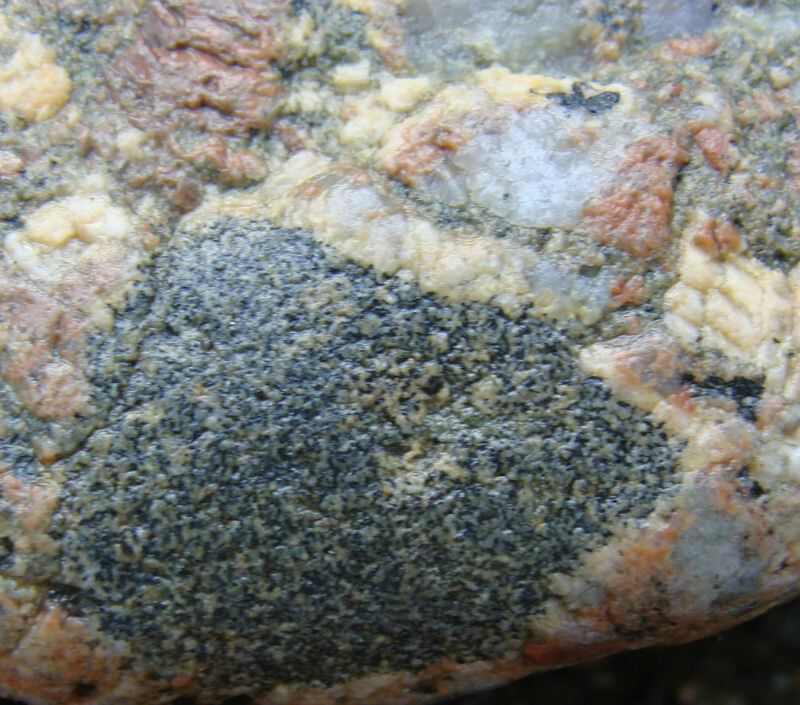 In addition, although there are no large masses of gabbro-diorite reported from the SW granite, there are inclusions of different sizes, seemingly xenoliths, which can be seen in outcrop, and more easily in the granite blocks along the sea wall from La Haule to Millbrook at the back of St. Aubin's Bay, obtained from former SW granite quarries. SW granites (oldest to youngest, left to right). 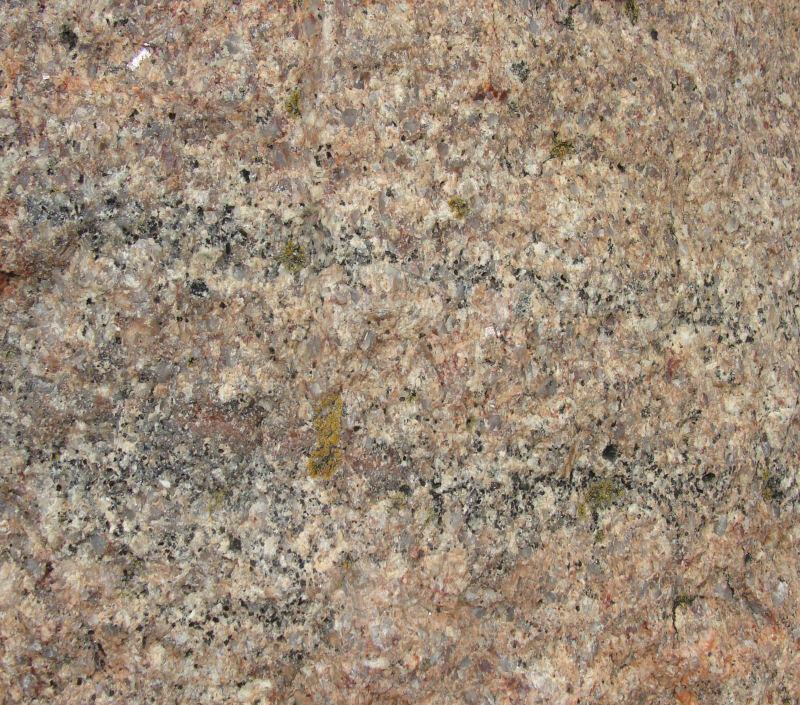 Coarse granite, La Corbière; outer ring. The orthoclase feldspars vary in colour more than the plagioclase in the different granites, from shades of red to yellow and white. They also vary in size and shape and occur as strikingly symmetrical (euhedral) crystals to irregularly shaped ones (anhedral). 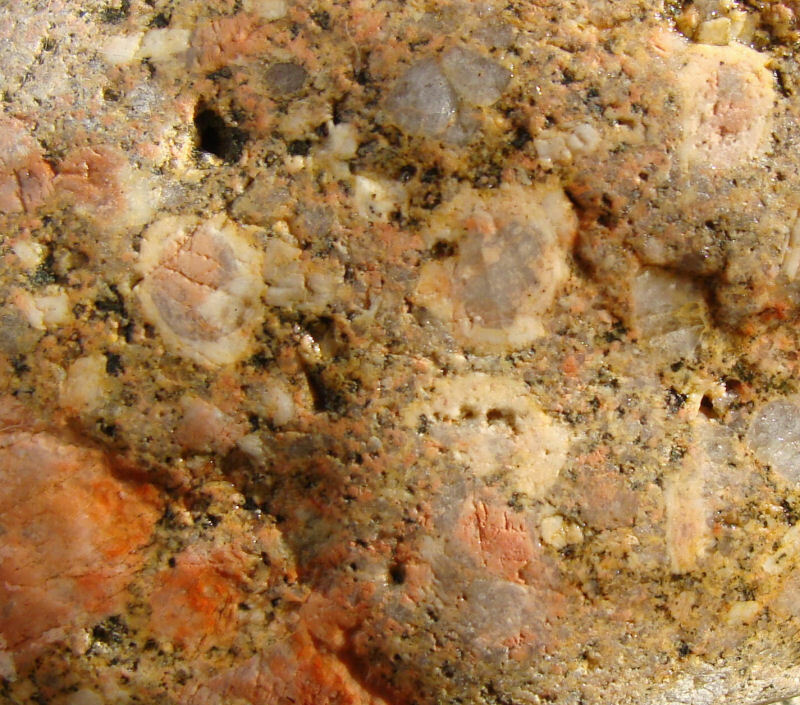 In addition, their internal texture varies; They are either red, zoned with red centres and white rims, white or yellow with variable types of inclusion, black hornblende being the most variable in the SW granites where it occurs as euhedral single and multiple small crystals to larger, anhedral concentrations. 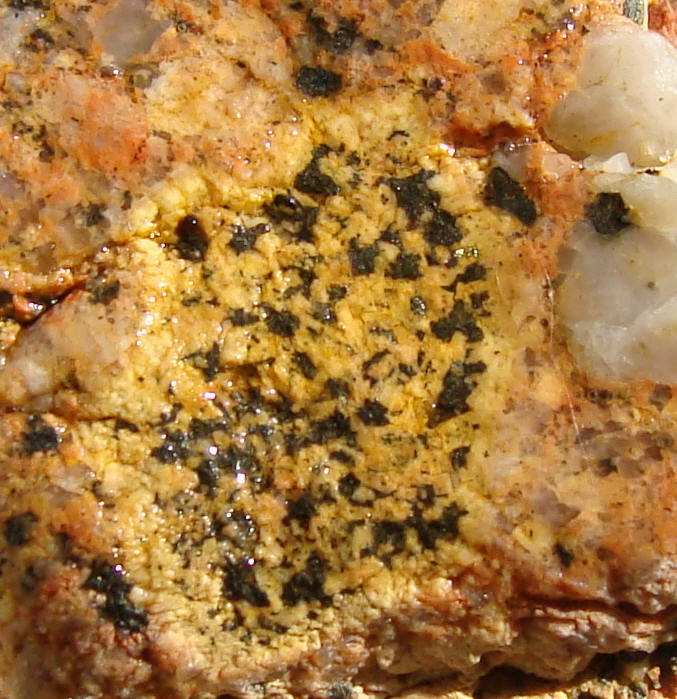 Various feldspars; red-brown; red, white, zoned white with pink/grey centres; yellow with a hornblende inclusion zone. Scale: x 1. 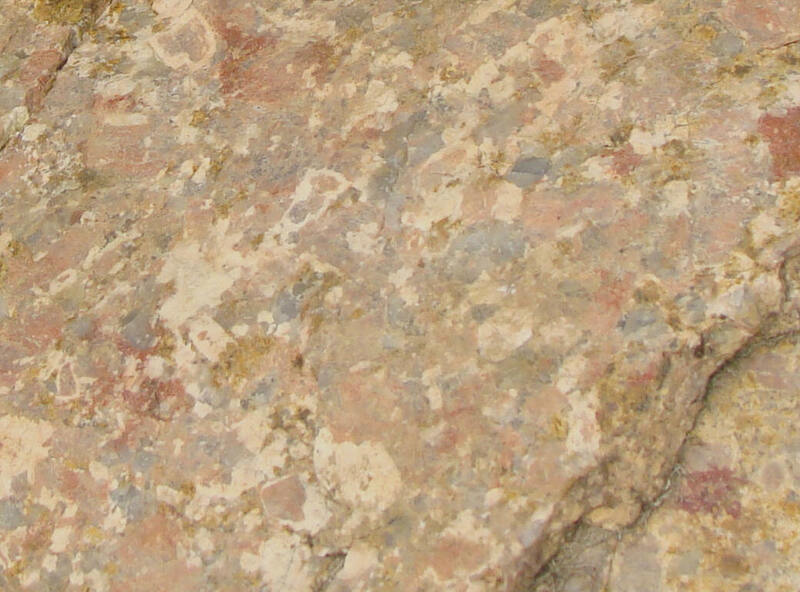 Small pegmatites in each granite mass show striking variation in the red feldspar and the milky quartz mosaics. 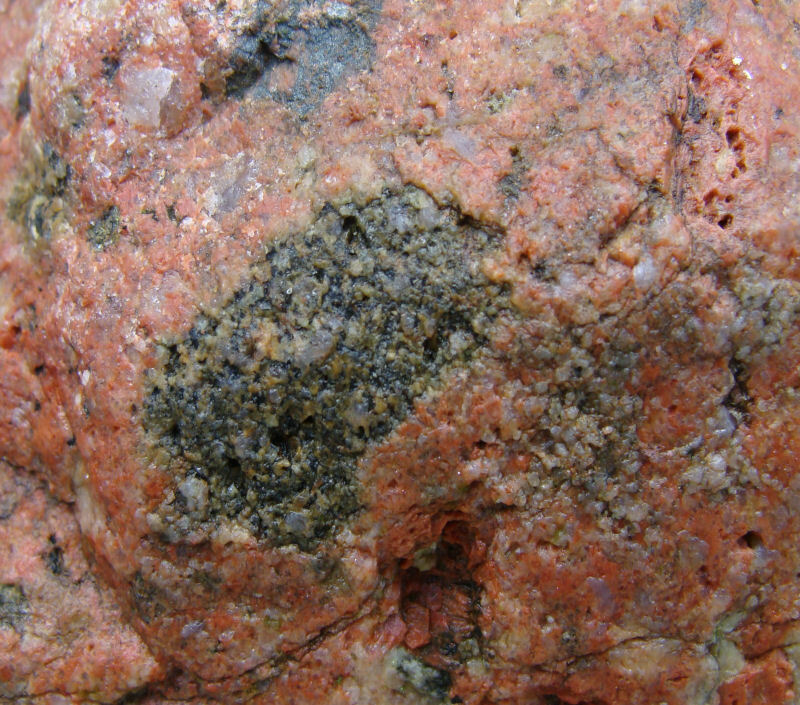 Adjacent to some of the pegmatites, strikingly variable concentrations of red feldspars, quartz and black biotite mica (see below) produce a patchwork of crystallisation history. The sequence seems that during the formation of the medium crystalline 'normal' granite, biotite concentrations developed, followed by the aplite, and finally the quartz-orthoclase pegmatite which occurs as veins along minor fractures (joints). Various small, localised pegmatite patches with white quartz and massive red to orange feldspar. Scale: x 1. 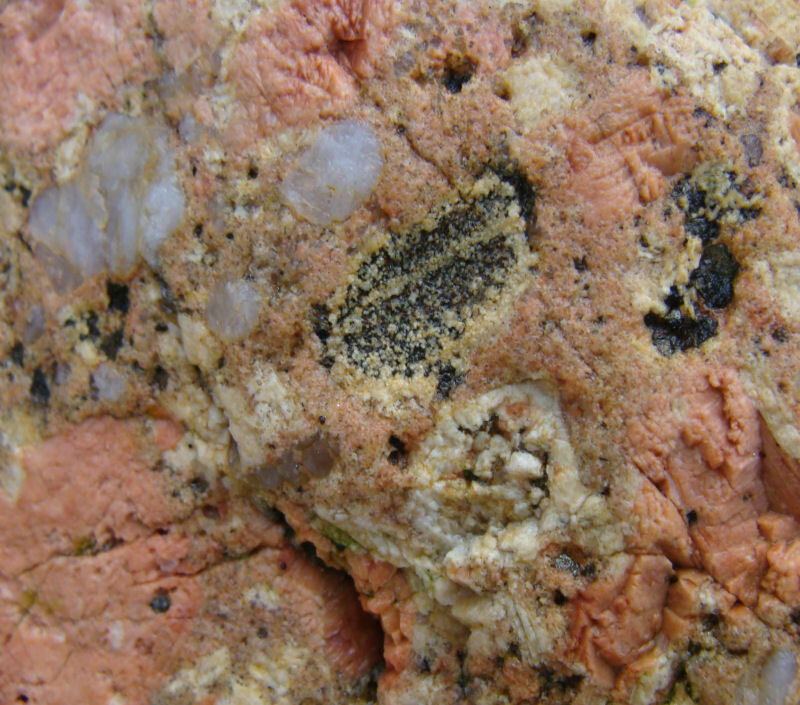 Biotite micas occur throughout the granites but seem to be locally concentrated in bands and small patches surrounded by the host granite or alternating with red aplite. 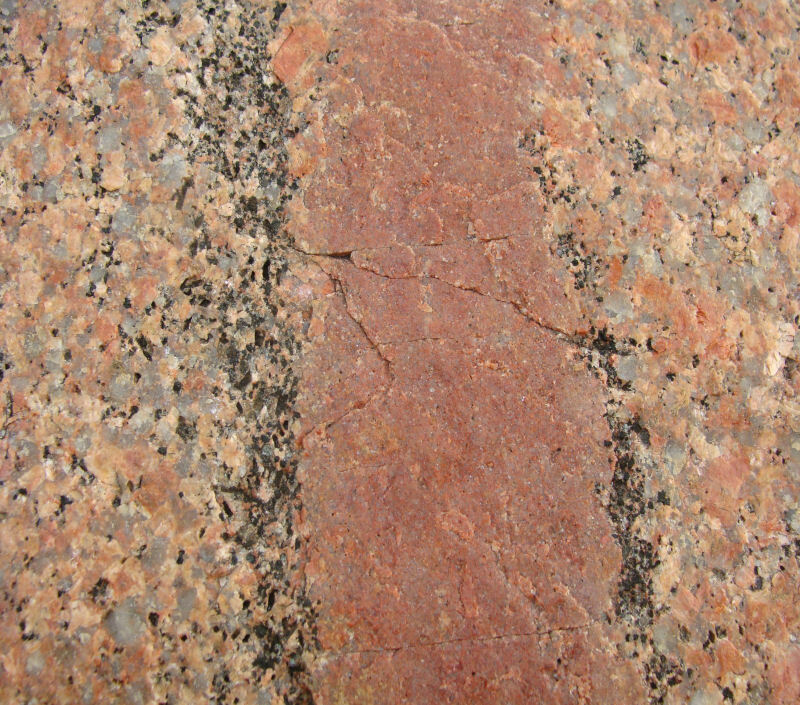 This banded appearance, found at Ouaisné and the south west Portelet Bay quarries, is described as a local phenomenon seemingly produced by interaction between the later aplite and the earlier Porphyritic granite (Bishop & Bisson, 1989, p. 56). What kind of interaction... diffusion? Is this "the movement of molecules from a region of higher to lower solute concentration as a result of their random thermal movement" (Allaby & Allaby, 1990, p. 158). Various biotite concentrations as areas grading into 'normal' granite mozaic, narrow bands and localised along aplite veins. 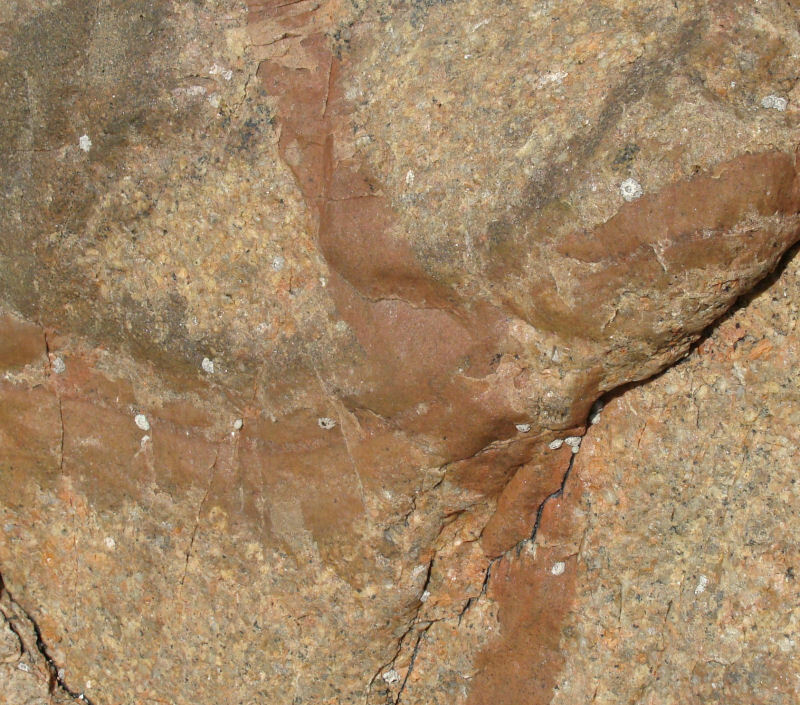 Aplite lens at La Rosière with possible 'feeder' vein (lower left) and isolated small pegmatite areas (top left). The aplites are generally red to brown, and finely crystalline with equigranular quartz and feldspar. They occur massively with little textural variation (Beauport aplogranite), but the minor structures... veins, dykes and lenses show interesting variation. 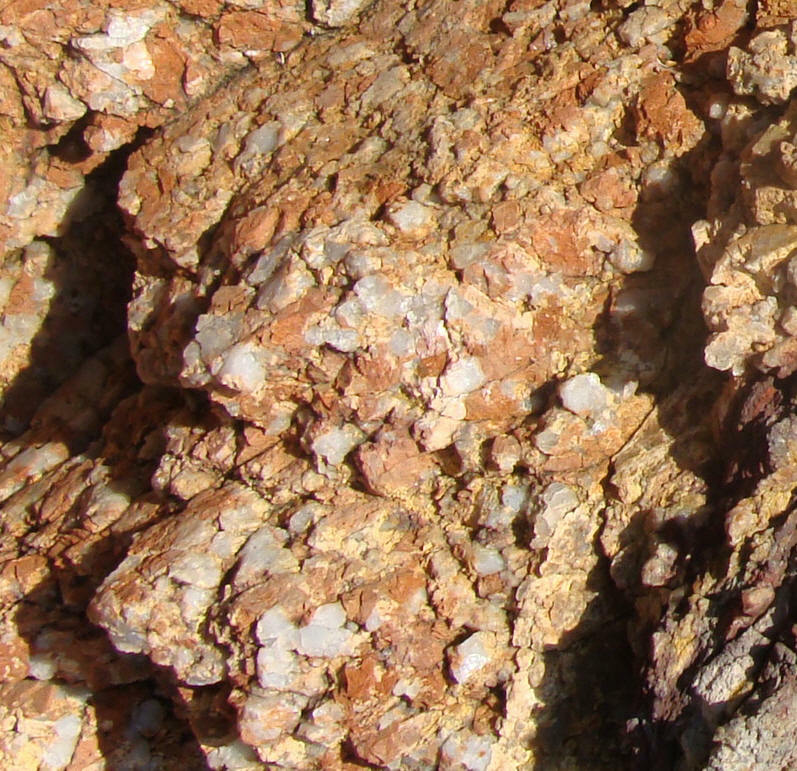 The junctions with the host rock are sharp and in some cases ragged/undulating, and some contain coarser, central parts with mafic minerals. 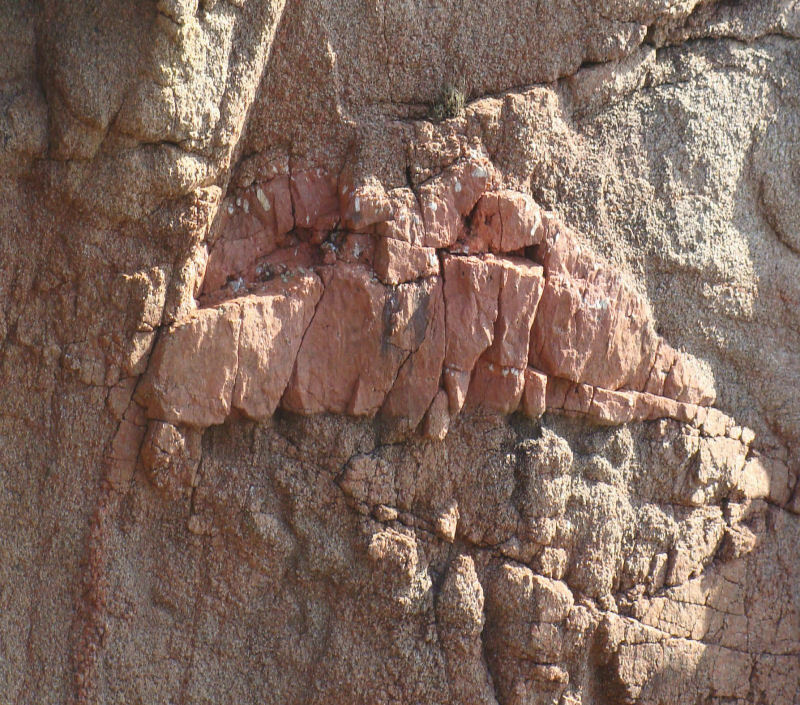 They represent late stage, low temperature magma, intruded along fractures which may have acted as feeders (lens above) and cooled quickly (sharp junctions), or more slowly to allow rising into the adjacent granite (ragged edges). Their strikes have not been measured. Aplite veins in different forms, single and multiple; they also occur as wider dykes in each SW granite. Xenoliths; Diorite-gabbro Patterns; Definite & Indefinite. 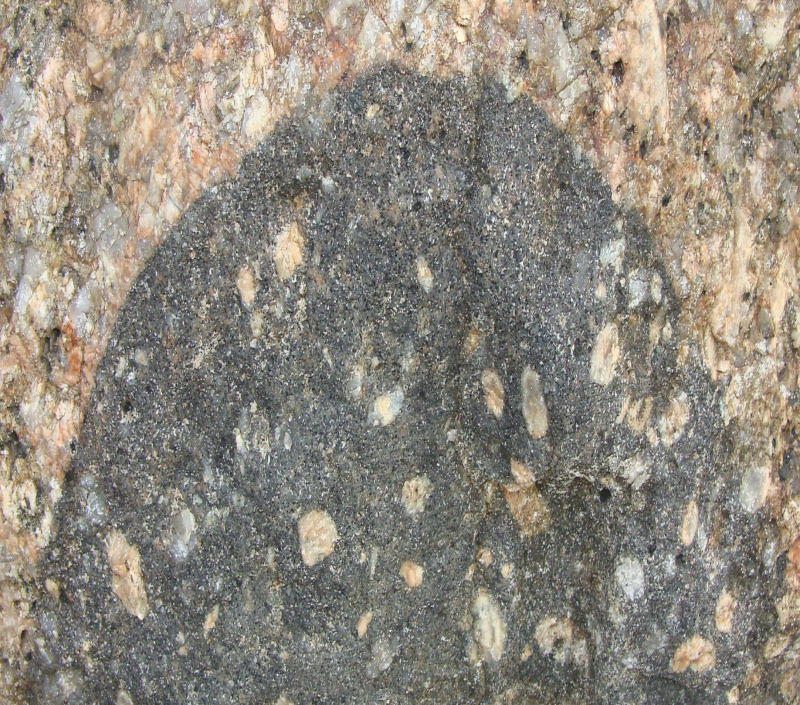 Small oval diorite xenolith and possible remnant basic areas, with quartz and feldspar micropegmatite patches. Scale; x 1. 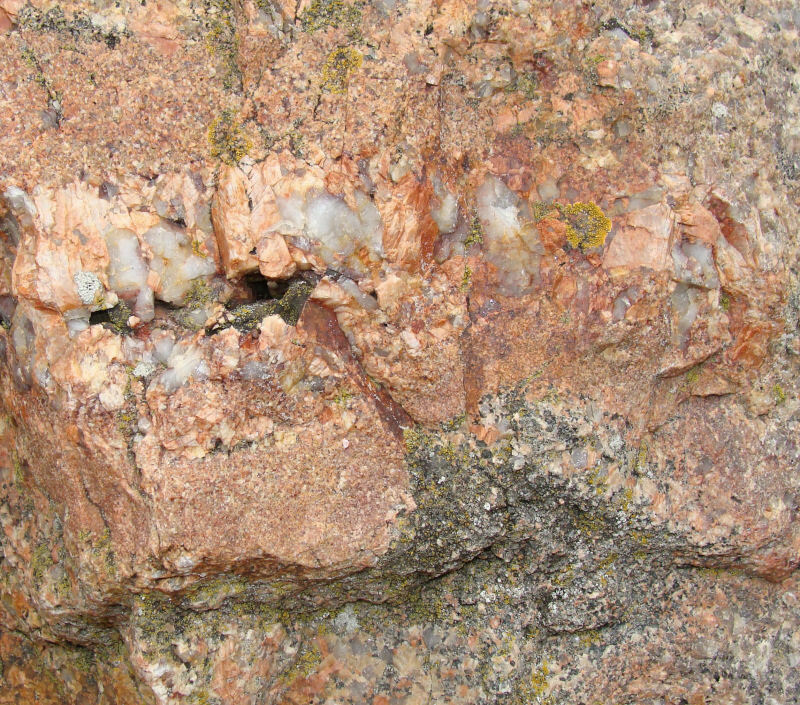 Xenoliths have been found in several places in the SW granite, in particular, in the Porphyritic and Coarse granites. They are very dark grey-black, oval shaped diorite inclusions with the black ones and possibly being gabbro. They have not been described or analysed/dated as far as is known, which would be helpful as the SW granites lack the larger outcrops of diorite-gabbro masses seen in the NW and SE granites. The striking feature is the range of concentration of white to pink orthoclase feldspars within the xenoliths, from rare to widely scattered, and denser concentrations where the xenolith is a 'shadow of its former self'. The different density patterns seem to show various arrested stages of alteration (granitisation) by the host granite. They also seem to indicate that these granites were intruded into a basic complex like the others but that assimilation took place to a far greater extent leaving only these remnants, or that the diorite-gabbro complex is at a greater depth in the south west of Jersey. 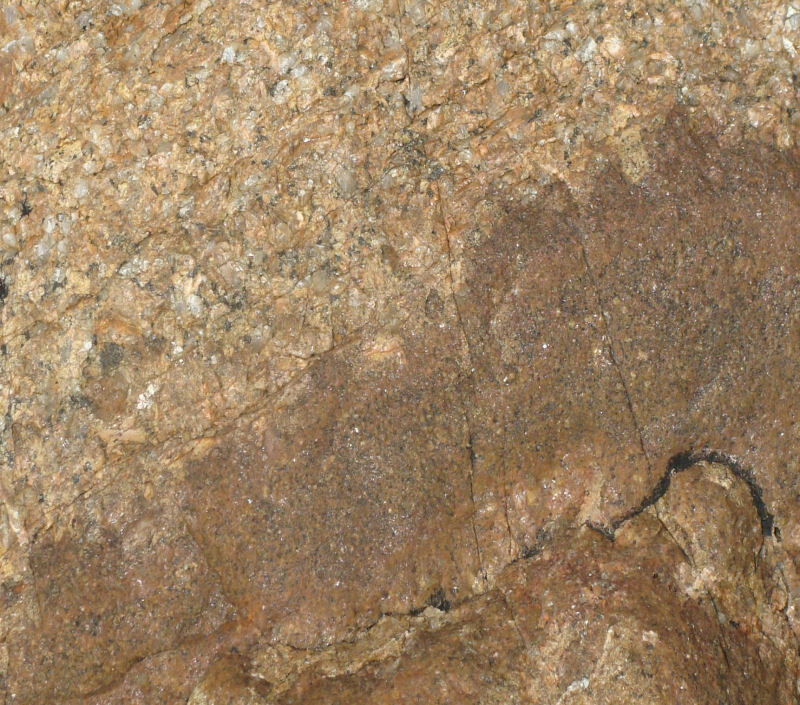 Xenoliths of diorite with variable numbers and concentrations of feldspars from the host granite. NB later faulting (lower centre). Scale; x 0.5. Other patches of apparent xenolthic material are smaller and scattered. They are aggregates of black minerals, some of which are surrounded by a narrow, pale feldspar rim/zone. 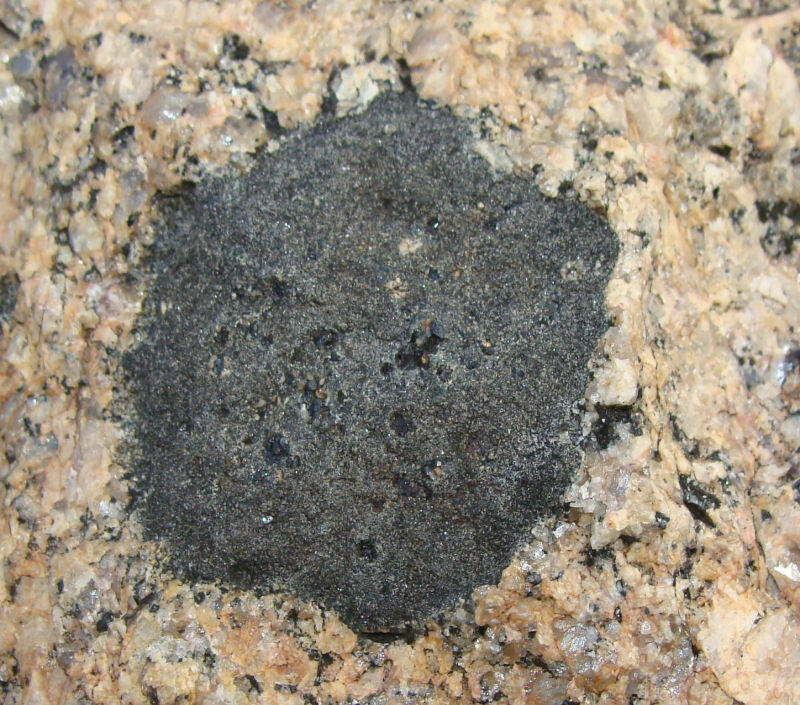 They are are regarded as apparent because they may represent hornblende and feldspar crystals from diorites, which have been more completely assimilated by the granite, or they may represent diffusion and localised concentrations of hornblende subsequently surrounded by the growth/formation of feldspar. 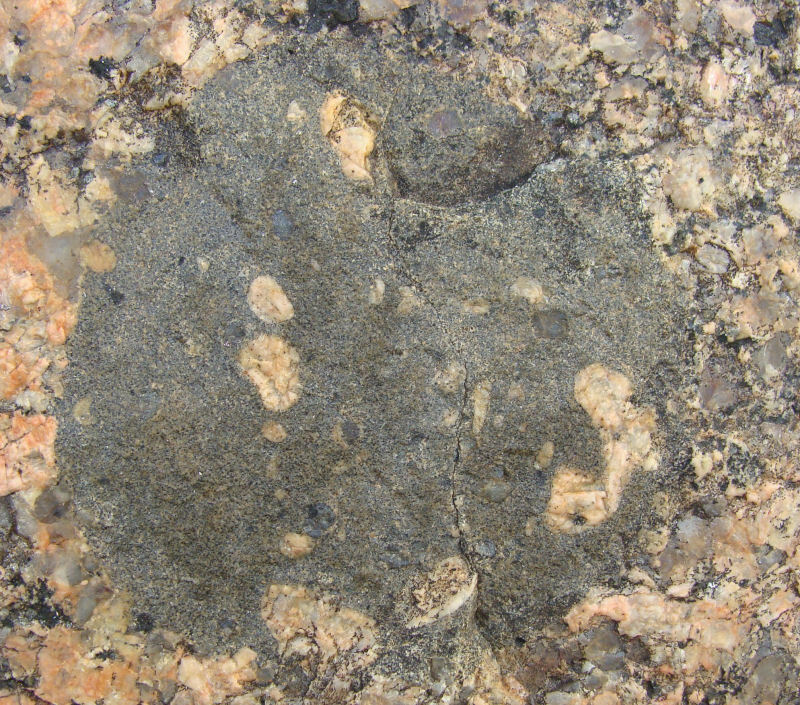 Compare the photo from Feldspar patterns, which seems to represent hornblende crystals incorporated by feldspar, to the proposed microxenoliths following. Small xenoliths of hornblende crystals enclosed by feldspar rims. Scale: x 2. A description of how the following were formed during (or following) intrusion would add greatly to the history of granite formation in the south west of Jersey. Specifically, what are the causes of the following and at what stages during intrusion/fractionation did the mozaics and structures form within the masses. 1. 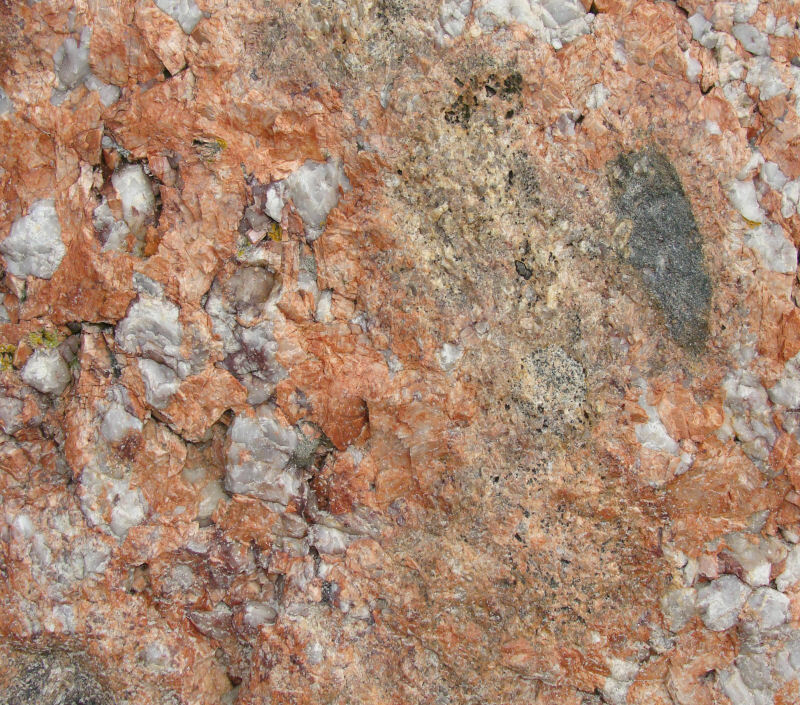 Adjacent red & white, zoned & unzoned feldspars, with and without inclusions. 3. Mica bands and banding in general. 5. Xenoliths, large and small, definite & indefinite. Briden, J. C., Clark, R. A. and Fairhead, J. D. 1982. Gravity and magnetic studies in the Channel Islands. J. Geol. Soc. London. Vol. 139. pp. 35 - 48. Brown, M. Power, G. M. Topley, C. G. & R. S. D'Lemos, R. S. 1990. Cadomian magmatism in the North Armorican Massif. p. 181 - 213, in The Cadomian Orogeny. Eds. D'Lemos, R. S., Strachan, R. A. & Topley, C. G., 1990, Geological Society Special Publication No. 51. Geological Society, London. Institute of Geological Sciences. 1976. Guernsey Sheet 49N 04W, Solid Edition. 1:250, 000 Series. Hecht, L. and Vigneresse, J. L. 1999. A multidisciplinary approach combining geochemical, gravity and structural data: the implications for pluton emplacement and zonation. In Castro, A, Fernández, C. and Vigneresse, J. L. (Eds). Understanding Granites: Integrating New and Classical Techniques; Geol. Soc. Spec. Publ. No. 168. pp. 95-110. Helm, D. G. 1984. The tectonic evolution of Jersey, Channel Islands. Proc. Geol. Assoc. Vol. 95. pp. 1 -15. Robinson, J. A. 1932. Geology Section 1931. Bulletin Annuel. p.7.